Well hello, folks. It’s the end of March, and there are some things you should know, whether you like it or not. There are only two days left to take the IU #PublishingFoul survey. Please check this out: it’s short, fast, easy, anonymous, doesn’t require a log-in, and even if you’ve never been scammed, please answer the first two questions. And boom, you’re done. 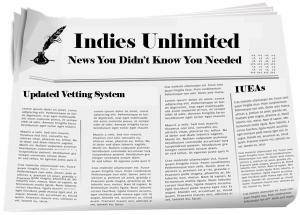 You may have noticed Indies Unlimited is now loading lightning fast. You’re welcome. In order to escape the server slowdown experienced by thousands of websites, we moved IU over to a new server. Now we can proudly say, “IU is all like BAM!” Because of those server troubles, some votes may not have registered in our #PublishingFoul survey. Please stop by the survey and check to make sure that yours have. If you see this: then your vote registered. If you see this: then it did not – and please do vote. We don’t ever ask for much, do we? Recently, some people have unsubscribed from the newsletter (blasphemy! how dare they?! ), claiming that we send too many emails. The newsletter only goes out once per day (we even send it manually now to make sure it doesn’t misfire), so if you are receiving more than one, that means you’ve subscribed to posts via WordPress. If you want to stop receiving those each time a new post goes live, it’s easy to unsubscribe. At the bottom of the email, you will see: Just click unsubscribe, and you’re good to go. Make sure to subscribe to the IU Newsletter, though! We’re always trying to add resource pages to fill the needs of authors. This past quarter, we added one with a list of places to find Beta Readers as well as Legal Resources for Authors. You can find a list of all our resource pages listed at the top of the KnowledgeBase. Yes, we’re hard at work on the 2014 Indies Unlimited Flash Fiction Anthology. That should be released soon. And don’t forget, the rules have changed for the 2015 Flash Fiction Challenges. We’ve implemented a panel of judges to select the top entries before public voting. Read more about the 2015 rule changes here, and don’t forget – you can’t win if you don’t enter! As weekend traffic slows down for summer fun, IU will be going to a new schedule. Beginning in April, we will be running only two features on Friday through Monday, which means that some of your favorites may move. Make sure to subscribe to the IU newsletter so you don’t miss any! Thanks again for being a part of Indies Unlimited. Don’t forget, you can show your support by sharing our articles, telling your friends about us, and if you’re feeling particularly generous, you can always make a donation. Happy Writing! Ya know, I didn’t want to say nothin’ to nobody about what happens sometimes when I click on an IU link and start wondering if the world ended or what. I’m looking forward to things that load sometime during the week when I click on them. Thanks for fixing things up. Malcolm, you shouldn’t have had any issues for about 2 weeks now. We have been on the new server for that long. It’s always nice to know what’s going on behind the scenes, be it issues that will be resolved or new ideas bubbling up. Thanks for the update.